Indoor bike workout is definitely a rage in the present times. If you’ve been to a fitness studio or a gym, you might have been a part of the crowd sweating it out on these spinning bikes. But there is always some comfort in spin bikes for home since they’re right there and save you from driving up to a gym and wasting more time waiting for your turn. Not only are they one of the best cardio machines but also strengthen your core to achieve your ultimate fitness goals. What makes Indoor spin bikes unique is the presence of a flywheel that you won’t find in other stationary bikes. They typically have a heavier flywheel upright stationary bike with many resistance levels that can be adjusted according to the level of challenge. A user can simply sit on the seat pad and pedal to spin the flywheel against the chosen form of resistance or brake. These exercising spin bikes create an optimal momentum controlled by the brakes, giving you a similar experience of riding a bicycle in the comfort of your home. Though the market is flooding with various best indoor bike models encompassing progressive and innovative features every day, it is not wise to start your workout on any random spin bike. This can lead to multiple injuries like back pain, neck pain, knee pain, handlebar palsy and patellofemoral pain syndrome. Top spin bike models with advanced features are available at decent prices and if ordered online, will be delivered to your home in a day or two. With an experience of 14 years in the fitness industry, my team and I want to make it easy for you. After testing a lot of bikes personally and deep research with my team, here we are with the best Indoor bikes in 2018 with outstanding features like good resistance levels, durability, comfortably built, etc., to make your workout a real treat. One look at Keiser M3i Indoor bike’s futuristic built and you’ll want to bring it home. If you’re not afraid to splurge one time for an incredible spinning bike workout every time, you should go for this uber cool bike with amazing features and durability. The latest addition to Keiser’s M Series line of indoor cycles, this beauty has a height of 45 inches, length 49 inches, and width of 26 inches, ultimately gaining a total weight of 85 lbs. Manufactured from high-quality material, it can easily tolerate up to 300 lbs of user weight and be moved around the house easily on the transport wheels at the base. This not-so-heavy spin bike engages the core heavily and makes you burn more calories. 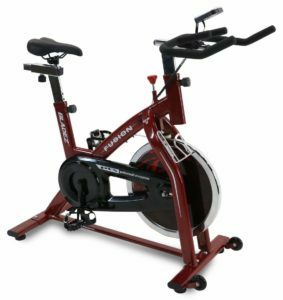 This indoor spin bike model has an eddy current magnetic resistance system with several magnets in action, providing 24 levels of resistance. This bike is belt driven as opposed to being chain driven, making it one of the best spin bikes with low maintenance. Keiser M3i is one of the top spin bikes with a backlit computer console displaying helpful information like Heart Rate, Current Gear, Cadence(RPM), Power Output ( Watts/Kcal), Odometer/Trip Distance and Elapsed Time. The computer console on this spin bike also has an incredible wireless Bluetooth and great handlebar adjustment that provides four different gripping positions to the user. The bike also has a four-way adjustable seat for maximum comfort and a water bottle holder to keep water handy so you’re never dehydrated. Unlike before, Keiser M3i can now connect to Golnd App which tracks your performance over the time. Though this indoor bike for home lacks pre-programmed workouts, it can download and track your workout data like no other bike at a worth of just 2000 U.S. dollars. The Sunny Health & Fitness Pro SF-B901 is a lightweight indoor bike that is fit for anyone starting from a beginner to an indoor cycling enthusiast. For anyone who is interested in basic cycling workout without the heavy glamour of a sophisticated design, this is the best spin bike available. 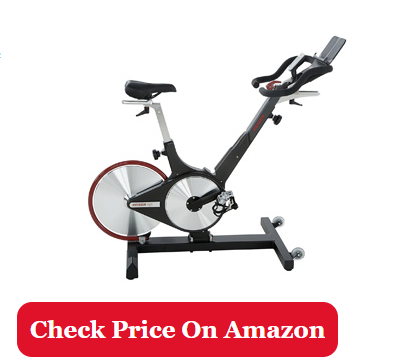 Get the best value for your money with this indoor spin bike having a bulky flywheel of 40 pounds that gives you a stable ride. With fully adjustable seat and handlebars, it can be customized for any user to help improve their fitness level or reduce weight. With its stylish silver and red design, a heavy duty steel frame and weight of 108 lbs, it is one of the top indoor spin bikes which provides you with a real-life experience of road-like momentum. Sunny Health & Fitness Pro is an incredible spinning bike with height 46.5 inches, length 48.5 inches, and width 29 inches. It can take up to 275 lbs of user weight and still provide a sturdy ride due to adjustment of the resistance level through a small knob. The thickly padded handlebars of this indoor spin bike can move up and down and provide multiple grip positions. The chain drive mechanism allows you a quiet yet enjoyable ride. Though Sunny Health & Fitness Pro, contains no computer or electronic features to track your performance, it is still one of the best indoor bikes comparable in quality to many other costly bikes. As the seat is slightly padded, there could be some discomfort especially if there’s a lengthy workout. Otherwise, this 300 U.S. dollar bike will be there with you for a long time because of its durable frame that once set-up, stays stable giving you endless opportunities for a super fit and healthy body. As I am also a rider by passion besides being a fitness freak, I suggest Spinner Sprint to everyone who has an insatiable desire for bike riding as well as to spinning bike experts. This is so because the pedals of this spin bike have a Q-factor of 155 mm optimized to match to that of the road bikes. It is said that the lesser the Q-factor, the better match it is to hip width to minimize hip, knee or ankle discomfort. Moreover, it’s a little easy on the knees and exerts no extra pressure due to the angle your leg sits on when pedalling, making it one of the leading spin bikes there exists. Designed with a commercial grade durability, it is still totally fit to be used at home and measures 48 inches in height, 55 inches in length and 20 inches in width. 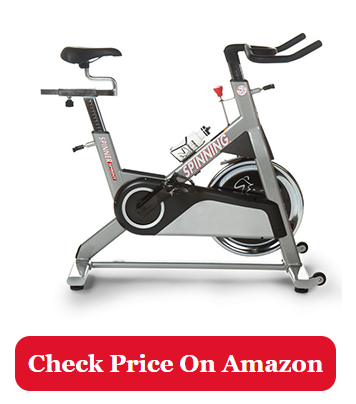 It has an extra heavy 48 lbs flywheel that maintains the momentum of a road-ride like no other spinning exercise bike. Even though it lacks any digital display and fitness tracking features, this 121 lbs bike is still one of the top spin bikes for beginners which can tolerate up to 250 lbs of rider weight with ease. As opposed to the more common adjustable handlebars, Sprint’s fixed handlebars are ergonomically designed and elevated at a 5-degree angle for maximum stability. If you are looking for a commercial grade bike at a competitive price, Spinner Sprint is one of the best indoor spin bikes. This 700 U.S. dollar bike is definitely an amazing buy having a leather top-down brake pad for reliable braking and a longer life-span. It may not be an ideal buy for you in case you wish for the luxuries of electronic features and advanced technology that help you keep a record of your fitness progress. If you are looking for an extraordinary combination of comfort and performance, Sole Fitness SB-700 Light Commercial is a fit buy for you. It is one of the top spin bikes designed to provide a feeling of an outdoor cycling enthusiast while training at home as well as a spinning bike aficionado who just loves a great workout. It is a perfect bet if you are looking for heavy duty, extra comfort and also comes with a lifetime warranty. This indoor spin bike has 48 lbs flywheel along with its Kevlar breaking design that makes every riding routine smooth and enjoyable. The solid frame extending up to 41.9 inches in height, 21.1 inches in width and 40.3 inches in length can accommodate users of nearly 300 lbs, making it one of the most sought-after spin bikes. It comes with a partially assembled mode and requires no help from a third party to get this mind-blowing spinning bike assembled. This 1100 U.S.dollar bike is all about comfort with the saddle and ride position that is ideal for long, endurance type training. Gain complete control over your workout with this well-manufactured bike that comes with a Tension Control Knob for variable resistance levels. Sole Fitness SB-700 Light Commercial falls into the category of best indoor bikes with monitors, having a fitness activity tracker monitor that lets you track pedaling time, speed, distance, calories, and RPM. This integrated backlit LCD computer also comes with support for heart rate chest straps and thus helps keep a record of the heart rate as well. This indoor bike has pedals with foot straps to keep your feet in place and help you keep going without any fuss. Though its price is on the higher end, the kickass design and functionality will provide you a quiet and focused workout time that you need. The last bike added to these amazing spin bike reviews is a high-end spinning bike that is lightweight and has an innovative braking system incorporating six magnets evenly distributing the braking power. Manufactured by the world-renowned bike manufacturer Giant Bicycles, this indoor bike frame is a symbol of strength even though entirely made of aluminium. Schwinn A.C. is comparable to many other heavy frame bikes with respect to sturdiness, performance and giving a real road ride feel, making it one the top-notch indoor bikes in the market. Let us tell you that the ‘A.C.’ in its name actually stands for ‘Authentic Cycling’ and that is what you get. If you are also enthusiastic about indoor bikes like us, you’d never want to miss out a real road bike experience on the Schwinn A.C. Performance Plus Indoor Cycle. Measuring 51 inches in height, 21 inches in width and 50 inches in length, this is one of the top spin bikes that comes with two different types of drive, Carbon Blue belt drive, and a Chain drive. The Carbon Blue Belt drive is made of polyurethane and includes a core of carbon fiber tensile cords. Soft nylon teeth lock in with the gears, providing you a quieter and smoother riding time. 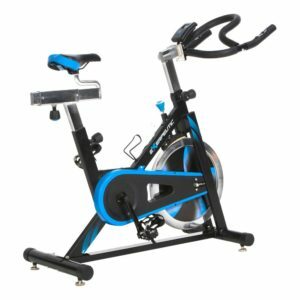 Though it’s a little pricey at 1700 U.S.dollars with the carbon blue chain drive, this is the best indoor spin bike that is both low maintenance and easy to assemble. It’s most brilliant feature is the Ergo Loop Handlebars with aero extensions that provide a 12-degree incline. Now you enjoy a greater freedom at hand positions and as for the aero bars, they’re come in really handy for triathletes and time-trial competitors. The adjustable seat of this spinning bike can easily accommodate a user weight of 350 lbs and still get one in shape. Move it around the home easily on its front wheels and workout like a fitness pro anytime. As compared to other modern spin bikes with monitors, there is no computer to update you on your fitness data but it’s a terrific buy if money is not a concern and kickass workout is all that matters. You may purchase MPower Echelon Console separately for nearly $250 that reveals RPM (cadence), calories burned, heart rate, stage time, and total time. All the spin bikes listed above have extraordinary features and cater to the different needs of fitness enthusiasts. We hope the deep research, technical details of each product and our personal advice really helps you to make a wise decision. Truth is, it won’t hurt us to be counted as one of the best spin bikes reviews you’ve come across. If you want a top-rated spin bike for your daily workouts that deliver solid results, then Sunny Health & Fitness Belt Drive Indoor Cycling Bike is a perfect choice for you. Facilitated with easy to use and easy to adjustment design, this equipment marks as one of the best options for the entire family. As an additional benefit, this equipment comes with reversible cage pedals and is very helpful during the more difficult resistance levels. Bladez Fitness Fusion GS II is one of the cheapest spin bikes that offers plenty of facilities at that cost. Its design and sturdiness make it an ideal choice for home use. With this equipment, you can shed out a consistent number of calories by enhancing stamina and strength. 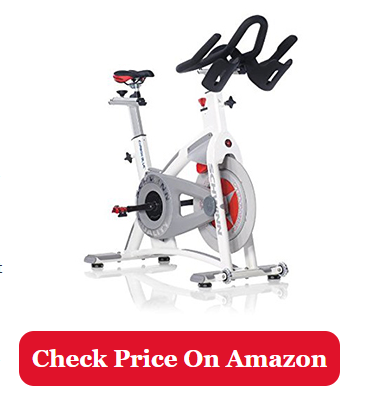 Its efficient design and smooth flywheel make it as one among top five spin bikes. Even it is famous for its lack of noise feature as many users stated that it doesn’t produce any noise while cycling and won’t disturb others in your home with a noise. This product tops the list as the best spinning bike that could be enjoyed by users of all ages including teenagers, seniors, and young adults. This bike with a cost below $300, comes with a one-year warranty on parts and all its wear item. It has a good size flywheel, and this heavy solid bike comes with a heart rate senso r that could make the user monitor his heart rate constantly. This equipment with all needed facilities offers it users, an intense workout that they want. 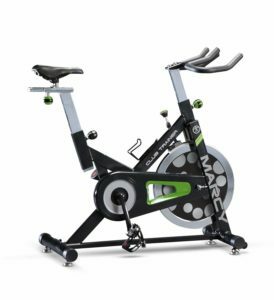 It’s worth its price, as it consists of many features that are impossible for any other spin bike at this affordable price. It has an eye-catching design with a blue stripe at crank guard and with the blue swirls on its flywheel. • Easy to Fix the parts. • Consists of heart rate sensors. • Have console to give feedback and motivation on performance. • Adjustment facility to suits people between 5′ 2″ and 6′ 2″ quickly. • Basic and low-quality design of Console, Uncomfortable seat. With 118.1cm height, 50.8 cm width and 121.9 cm length, Sunny Health & Fitness Pro spin bike is very popular indoor cycling equipment. Whether you are a beginner or an advanced user, this affordable indoor spin bike makes you get in to shape easily and helps you to stay fit. Its consists best computer features and comes with little luxuries. It is of lightweight yet durable. Because of its lightweight, it can hassle-free transportation. Its 40 LB flywheel indicates its one of the best feature as it increases the efficiency of the workout. It looks stylish with silver and red design. • Great level of resistance. • Emits little noise on high resistance settings. • No LCD display provided. With a high range of facilities, Marcy XJ-3220 Club Revolution Cycle Trainer offers an excellent exercising machine at home. With less weight, this spin bike is smaller and lighter when compared to the above-mentioned spin bikes. However, with small size itself, it has quite more to offer. This spin bike provides a decent setting for an intensive spin workout. 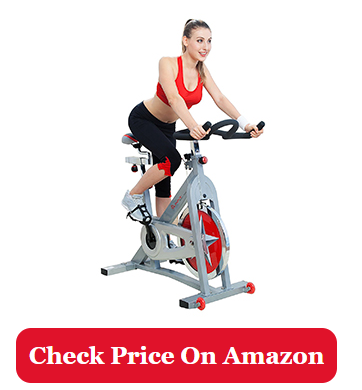 If you are in search of quality yet cheap indoor cycling bike, this model is definitely a top one to put on your list. • Consists neither console facility nor workout programs. Low Impact Workout: Give less trouble to your body joints with spin bike exercise. A heavy cardio exercise like running will weaken your hips, knees, and ankles causing a serious ailment after some years. And even though there are other bikes( Upright bikes and Recumbent bikes), there’s no debate on spin bikes being the best. Upright bikes reduce the pressure on the neck and hands but increase the pressure on the groin area. As maximum weight is supported in this area, the once comfortable workout can turn into a complete nightmare in the future. Even with recumbent bikes and their super comfortable recliner chair workout position, indoor spin bikes are your best bet indoor when considering cycling outdoors in the future. Moreover, pedalling in a reclining position may be uncomfortable because of the glutes (leg muscles) not getting engaged sufficiently. Improved Heart Health: Though indoor cycling is best for losing weight and developing lean muscle, there are matchless cardiovascular benefits of the same. Many experts agree that just 20 minutes of daily physical activity that increases the heart rate gives you a healthy life and reduces your possibilities of heart diseases and other chronic health problems. Calorie Burning: Can you imagine burning anywhere between 400 to 1500 calories (close to the calorie count of a normal meal) per spin bike session? You’re actually cancelling out an entire meal that way and reducing calorie assimilation. Moreover, indoor spin bikes help boost your metabolism, increasing your resting metabolic rate and allowing you to burn more calories even after the workout. Full Body Workout: You heard it right! You’re not just working on your legs while riding these spin bikes for home. Your entire body is under the positive influence of the spinning bike workout sessions. For example, holding yourself in an upright position and gripping the handles works your arms, back, shoulders, and abdominal muscles to varying degrees. Get Stimulated and Feel Great: Just after 20 or 30 minutes of cycling, you’re going to feel euphoric. The endorphins in your body get released during an intense spin bike workout which will keep stimulating you. It’s a great way to tackle depression and improve your mood. Save Money: Ever wondered about your heavy subscription fee at the gym? Isn’t that your hard earned money going out of your league every month? Even getting one of costliest and top spin bikes is a one-time investment. If you’re working out in the comfort of your home, you’re going to save money and still follow your passion for spin bike cycling. Resistance: Resistance feature of a spin bike is critical to getting a good workout experience. There are generally two types of resistance- frictional resistance and magnetic resistance. The former is common with older models where a set of brake pads rub against the flywheel. Friction resistance has its own disadvantages as the brakes wear out easily and need replacement and it also creates a lot of noise. On the other hand, magnets enable smooth resistance with minimal noise. Add a belt-drive to this and there is hardly any noise with saving on maintenance. As resistance can be adjusted throughout the workout, you can create the best workout and complete your fitness goals. Fit and Adjustability: It doesn’t matter how good your spin bike for home appears, if it doesn’t fit you properly, it is not helping you. Thus, it is important to choose an indoor spin bike that has adjustable handlebars, adjustable pedals and adjustable seat position. Most advanced spin bikes have at least 3 hand positions for comfortable riding. The seat position is the most important as the distance between the seat and the pedals will determine the level of the enjoyability of your indoor cycling experience. Though vertical adjustment is common to many indoor cycles, there are top spin bike models where seats can be adjusted in multiple directions. Flywheel and Weight Capacity Considerations: Some higher end spinning bikes that are commercial-grade equipment can be very heavy due to their bulky metal frame. This will impact your decision of choosing the right corner to fit it in even though many now come with transport wheels at their base. Many spin bikes feature heavy flywheels that simulate the ride of a real road bike. The heavier flywheel creates and maintains a momentum that keeps the bike steady and weighted down as it spins. One has to also consider the user weight these powerful machines can tolerate. Most heavy duty bikes are rated to accommodate at least 250 lbs if not more. Electronic Features and Computer Display: If you are working so hard on your body, you definitely want to monitor and optimize your fitness routine for best results. Most modern spin bikes, for e.g Keiser M3, have a superior digital display with information about your heart rate, calories, time, etc. 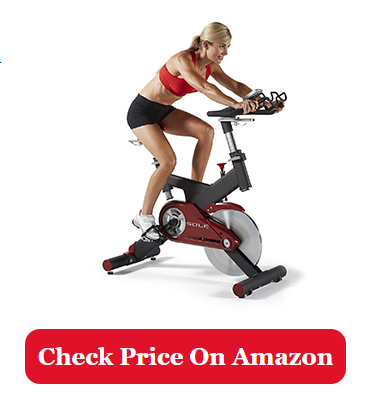 Price: However much you may love static spin biking at home, you struggle with settling for the best spin bike not only because of the features but its price. Though the price is an important consideration in selecting a good spin bike, we suggest you never compromise on the quality of workout and make your decision wisely. I and my team wish that it has been a pleasant experience for you who are reading all this valuable information on the Best spin bikes 2018. We hope it helps you make the right spin bike choice today.